Councilman Alex Mendez received the backing of two Hispanic organizations, which his campaign views as significant endorsements, at the steps of the historic City Hall on Saturday afternoon. 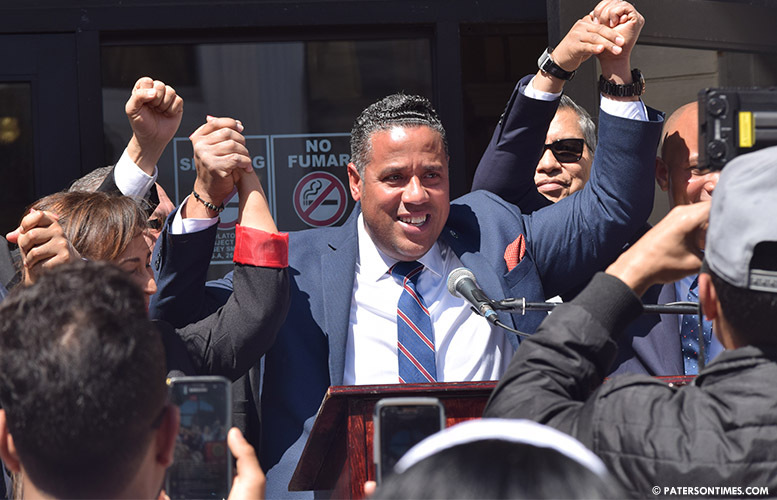 Mendez beat out councilman Andre Sayegh, the only other candidate to seek the backing of the National Dominican American Council and the Political Action Committee of the Latino Leadership Alliance of New Jersey. “By all measures, no other candidate in this campaign compares to Alex Mendez,” said Leodany Inojosa, president of the National Dominican American Council. Mendez is one of two men of Dominican origin running for mayor. The other is Pedro Rodriguez. Both have a chance to become the city’s first mayor of Dominican background. Both groups also endorsed school board member Flavio Rivera for an at-large council seat. Rivera is one of 14 people seeking three available council seats. “Mr. Rivera impressed us as a young visionary leader who is pragmatic and capable,” said Inojosa. Maria Teresa Feliciano, president of the Political Action Committee of the Latino Leadership Alliance of New Jersey, said there was a “rigorous interview” process that led to the mayoral endorsement. Out of the six men running for mayor, Sayegh and Mendez sought the two groups’ endorsements, said Feliciano. Sayegh said the people, who conducted his interview, told him his presentation was well made. He said people in the room told him his presentation was “vastly superior” to Mendez’s. “I’m just hoping the process was fair,” said Sayegh. Rodriguez does not view the endorsements, described by Mendez as “significant,” as major endorsements. “That’s Maria Teresa. Both are Maria Teresa. They have no traction. It’s just soundbite. It doesn’t have any weight in the race,” said Rodriguez. He did not seek the support of either of the groups. Rodriguez said both groups backed former governor Chris Christie, who had a scandalous second-term, for re-election. He said Feliciano, who ran for mayor four years ago, had the backing of both groups, but ended up with just 1,500 votes. Feliciano finished sixth place in an eight-person race four years ago. “I’ve been getting endorsed by people on the ground, people who know the issues. I don’t need any politician’s endorsement,” said Rodriguez. This report was updated at 6:30 p.m. He can't even pay his water bill on time LMFAO. He has lowlife scumbag written all over him, although none of the crooks running for Mayor aren't much better. Paterson is a shithole and will only get worse. The best thing you can do if you live in that shithole is save up to move out of there.